Congratulations on your elementary debut. Hey, want to come to the fifth grade class I teach in San Francisco? So my life changed watching jk-4 math classes.. I saw great things.. now as a jk-12 math chair I am working with all teachers seeing classes, and more. What is more fun than teaching bc calculus then going to teach a grade 3-4 stem activity with zip lines… a math challenge. Those who have not tried need to go, observe, get involved. We use INVESTIGATIONS… which is amazing to see kids learn…. agree that the research is mixed. Probably due to a few lurking variables. 1. the education of teachers generally began with traditional algorithms, 2. the students may not experience a “throughline” of preschool to high school of the non traditional algorithms, 3. parents often teach what they know – so they introduce the algorithms while alternative ones are being done. Fear of falling behind. 4. Students see a “rule” as easier-faster to learn as they compartmentalize learning into “facts” and many more. This is an interesting paper – one of many that discuss the shift…. Congrats on a successful experience outside of your comfort zone! This year, I have been working in elementary schools primarily and initially, I was hesitant like yourself. Not only was I nervous to work with younger students, but I was also unsure that I had anything meaningful to offer at that level. Five months later and I’m loving the younger grades. I’ve learned a ton from my elementary colleagues and I’m starting to make connections I never realized between primary and secondary math. My current focus has been how to create tasks that start with really basic concepts and extend them up to algebra. Looking at math through this lens has really opened my eyes to how we might better ensure students can connect the dots all the way through. The task starts as a simple subitizing problem, then an array, then order of operations and moves on to algebra. Excited to try and think up some more that can start with such a low floor and high ceiling. Congratulations on surviving elementary school! Let me know when you’re in Southern California and want to make your debut in first grade. I think you would be astounded with their discourse! I like to ask them “Find out what your partner thinks about _____.” Then, like you said, ask them to share what their partner said when thinking about other students’ work. The more I learn about the progressions and study Van de Walle’s Teaching Students Mathematics, the more excited I get about the math we learn in class because I understand more about where it is going. Maria Blanton has shared a ton about developing algebra and algebraic thinking all throughout elementary school. Super interesting work. I was allowed to guest teach in fifth grade last week. That was pretty exciting, and it again opened my eyes to how important content knowledge is because I wasn’t prepared for how one student responded and I think I left money on the table there that could have benefited the whole class. As always, thanks for sharing! Please, come visit any time! Wait…. Could “a different jar [of the same size]… change the number of Skittles?” You’re saying it wouldn’t. Why not? Can I please re-invigorate this debate? Isn’t is reasonable to assume that even if the same number of packets is consistent, that there is *some* small amount of variability with the number of Skittles between the packages. I didn’t really give the debate its due explanation. We had a fixed number of packages with a variable number of Skittles between the packages. But the total Skittles is conserved. Swap one container out with another and the number of Skittles across those packages isn’t going to change. Ok… lemme think about this. A fixed number of packets with a variable number of Skittles between the packages. Idea 1: Total in jar will be fixed, since what? Since number of packets is large enough that the average in packet is realized? Idea 2: Total in jar will have some possible variability, since what? Since each individual packet might have some variability? Yeah, but we were debating Idea #3: a different jar will change the total number of Skittles. Or are we? I think we’re debating whether different packets will change the total number of Skittles. Either way, I like this. As a third grade teacher of math, I’m thrilled to read that your observations match my own experiences. I’m inspired to invite our high school math teachers into the classroom for a bit of dabbling in next-level conversations and pedagogy. More of this, please! Also, you’re wacky enough. Or, at the very least, I’m sure you would do what it takes, regardless of how “it” would fall on the wackiness spectrum. When I teach two-digit multiplication, I subliminally teach algebra. See my method on my YouTube channel. It follows the binomial square concept. I actually went the other way: I taught third grade for several years before I switched to high school and now I teach Math 1 but that experience was invaluable. I think we, adults, underestimate what children are capable of. I spend a lot of time in my high school math classes developing math vocabulary, something that, for whatever reason, I thought my third graders couldn’t handle. I know now how wrong I was about that. We miss out on cultivating real interest in math when we underestimate what young children can, and more importantly want to, do. I know now that it was easier to encourage curiosity in my third graders than in my high school students. I didn’t capitalize on that at the time and I regret it now. Like Marilyn, I started as an 8th grade math teacher and quickly realized I wanted to move down in age. It seemed like understanding of multiplication/division and fractions (rational numbers in general I guess) was the basis of EVERYTHING I taught in pre-algebra/algebra, so I landed in the year that students first dig deep into those – 3rd grade. It’s terrifying and awesome. Nice vignette about your 4th grade teaching experience. Former High School math teacher here, and in my role as PD provider, I’ve had multiple opportunities to model lessons in K-12 classrooms. I still remember listening to Kinders argue which is taller, a house or a tree. It was great! Turning to talk to a partner, these little people justified their decision using evidence about their own home, house, apartment, and the trees surrounding it. It was great! Sadly, during a wonderful chat about percents of numbers with some 7th grade students, their classroom teacher said, “I had no idea they could think about percent and understand it in that way.” UGH. The students had just completed ‘finding a percent of a number’ worksheet in which they basically used a sequence of key strokes on their non-scientific calculator. Double UGH! I love talking to youngsters about THEIR ideas….age 6, 12, or 18! Great post and congrats on going out of your comfort zone. My first reaction to that comment was whole hearted agreement. I never really gave elementary math much thought until I had kids. That paired with the amazing folks in Mtbos has given me a new appreciation and fascination at what elementary teachers do. I currently teach 7th grade math because, for me, it’s always been that perfect pairing of math that I can find enjoyable and students that I can find enjoyable…but in researching elementary math for my kids, I wonder what it would be like to teach younger students, although I’m pretty sure I have neither the energy nor creativity to survive (I can’t make a bulletin board to save my life). Elementary math is more broad: It’s all about number sense and foundations of mathematical understanding. That is incredibly important and is often where people lay blame when students grow up with poor number sense, so it’s where we (mathematicians) tend to focus our research. Elementary teachers talk to each other more than secondary teachers…maybe. This is absolutely based on personal experience and I’m sure it’s not the case everywhere, but I tend to see elementary teachers ask for help more often and more open to discuss their failures. Secondary teachers tend to be the experts so there isn’t as much need to discuss different approaches. Chances are, this isn’t overly true of your readers and I’m only observing secondary and elementary teachers from here in the middle…but since it seems more teachers discuss math pedagogy in elem, it’s more developed and interesting. On a personal level, I’ve thoroughly enjoyed researching elementary pedagogy because there’s something special about seeing the young mind at work. The brain of a 6 or 9 year old (the ages of my kids) is an amazing thing and I could sit and listen to them talk about math forever. It takes a little time – but honestly – even after teaching Calc III, AP courses, the grade 3-4 content can be exciting. especially if students are allowed to engage and not following “standard algorithms” and you see where it leads. Much like teaching Alg I knowing the Calculus ahead is exciting. I spent my first teaching prac with a Year 1/2 class and my colleague teacher was teaching the class about arrays. She turned everything into a mathematical opportunity and extended every discussion to include addition AND multiplication. Someone’s birthday? An array of muffins. Class prize? A chocolate block. Just finished art? The materials would reappear on the floor in yet another array! Each was a different size which made me think about factors and the work that she put into extending the arrays towards multiples of 12 (which have more factors and therefore more arrangements). I was fascinated and very thankful that such young minds were exposed to such broad discussions! Again, no algorithms were necessary. Hi, great story! I had a similar experience: I taught high school math in the UK (6th-12th graders) for 10 years, and last year guest taught every year group in a local elementary school (K-5th grade), doing investigational problems. It was terrifying but highly enlightening. I did an activity about sorting and classifying shapes based on their properties with the kindergarten class (UK Year 1, 5-6 year olds), similar to an NRICH activity (http://nrich.maths.org/5997), and was amazed that they stayed focused and engaged on the activity for a whole hour. We can so easily underestimate what younger students are capable of! Boy, I remember my first time teaching elementary school too. I was teaching mostly high school at a K-12 school, but landed a 4th grade classroom (just the math) in my second year. As good as I felt about my work with the ninth, tenth and eleventh graders, working with the fourth graders was a huge challenge. It ended up being the major focus of my work that year, especially since I was designing most of the curriculum myself, and all my instincts from the high school level didn’t seem to work at that age. Fortunately, I was bailed out by another teacher, who had designed a bunch of curriculum and offered it to me to use. (This was 2003.) A big part of what I learned that first year was about having two or three shorter tasks to do, rather than one large one, which was my typical strategy for high school. It was a challenging year. I made a lot of mistakes, and grew a lot as a teacher. What’s interesting is that now, fourth grade is one of my favorite grades to teach, and—as you say—I absolutely expect fourth graders (and younger kids too) to be able to focus for 60 minutes or more if the subject matter is compelling. Thanks for the post, and for sharing this @gletchy 3-act! And for underlining the purposeful wackiness of elementary teachers. It’s like they have superpowers. Not much to add to what’s been said above, only that it must be gratifying to see the 3-act construct you created for high schoolers play out in elementary school. Big thanks to Graham for creating so many of those tasks. And if you really want an experience, try doing a 3-act with kindergarteners! Everyone has their right to an aesthetic preference for particular areas/topics/levels of math. The cool thing about math is that (almost) every topic can be really fun to investigate because it is open to a deeper exploration of pattern, structure, and connections to other areas. A weakness of math education is that again, almost every topic can be presented in a way that is closed, shallow, isolated, and boring. Also, I’m going to outbid @Joe Schwartz: many of Graham’s 3 acts (and many of the Desmos activities Dan has highlighted here) work well with 3 or 4 year olds! 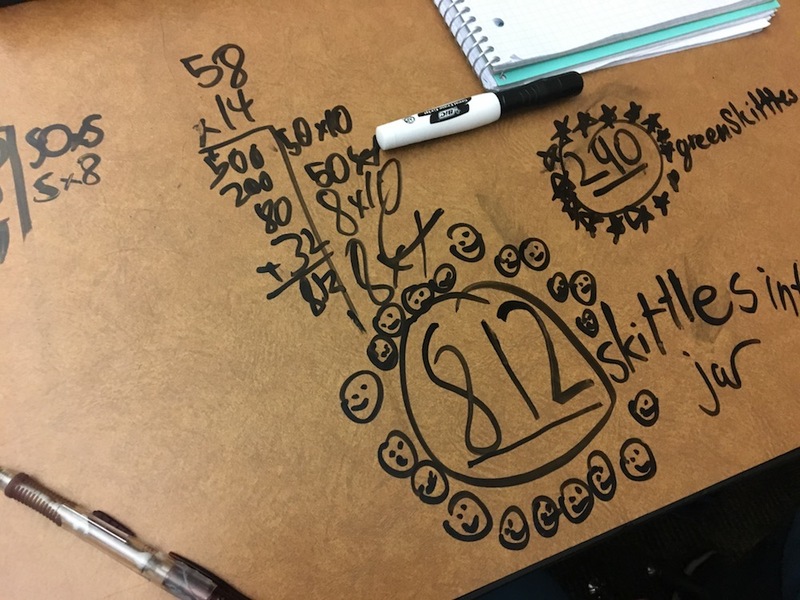 We don’t always get to the intended ending point and we don’t always follow the “standard” path through the activity, but we always have a fun and rewarding mathematical discussion. I featured a bit here I thought was really helpful. Your comment helped me realize that my aesthetic preference for secondary math may result in part from a wobbly understanding of primary math. Dan, thanks for sharing. As an elementary teacher, I’d love to experience, and hear about, the opposite (ET to HS). There seems a divide, sometimes unhealthy, btwn the world’s of ET and HS (understanding, bias, instruction, content, etc). Thoughts on bridging that divide? What do you mean ‘divide’? Great question. There are certain tasks, like the Pool Border problem, that have hooks down in primary instruction and can extend up to secondary. I wonder if lesson studies ever cross that many grades. Apologies, I should have better clarified the word ‘divide’ better. I haven’t checked back past few days. Flu got the better of me. When I say divide, I think I mostly mean in terms of instruction. I’m in elementary and am about to make a wide sweeping generalization (so forgiveness if it’s too big). I think many of us, not all, in elementary, if we’re being honest, do not understand math to the level we should. We don’t always understand how early childhood to elementary to adolescence to high school builds mathematically. I think our instruction really matters, but I couldn’t tell you specifically how it builds for later mathematical development. Likewise, I couldn’t do what you do in the classroom. I could run a lesson, but I couldn’t interact with the math. Just being honest. But I think our elementary instruction could become more robust if we could. I’m not sure if it works in the opposite direction? HS to elementary? So my question was asking how we begin to bridge that divide? Hope that makes a bit more sense. This I understand. I am a JK-12 Math Chair and have meetings with teachers at all levels. I would say that even the “best trained” math teacher at any level, has trouble in connections. Knowing math is not the same as understanding and being able to teach it. We use Investigations, which is a very detailed course and flow. Teachers who spend the time reading it, following it and teaching – often find the inquiry is there, they can lead a good conversation and like math. only think – I need to prepare my kids to think and adapt. As someone who is currently pursuing my Single Subject Teaching Credential, I have been entirely focused on teaching high-school and middle-school students. Having recently transitioned from teaching in a high school to a middle school, I have been quite surprised (in a positive way) to observe the impacts and changes in teaching that have occurred within the last few years. At the high school, everything was much more straightforward, and it was sometimes difficult to discern the concepts that students struggled with, because they were expected to know so much. After all, these individuals were fundamentally still products of the pre-Common Core era, wherein procedural work and memorization were viewed as sufficient to demonstrate understanding. Once I began teaching at the middle school, however, I immediately noticed how the standards had affected students’ learning. I realized that my seventh-grade students were first-grade students when the standards were implemented, and as a result, had been exposed to a different way of thinking since- essentially- their educational/academic birth. These students seem more willing to explore mathematical reasoning, and ask questions on deeper conceptual levels than the high-school students did. Nevertheless, I could have an exaggerated perception about these generalizations, but the distinctions are, at the very least, quantifiable. I was enthralled to read in your post that these fourth-grade students seem to have a firm grasp on number sense, and that you didn’t notice anyone “carrying” digits during the multiplication process. I feel like if I had had this exposure and opportunity when I was in the fourth grade, I would feel more confident teaching at the elementary-school level. The new standards are a filter, in a way, to ensure that teachers actually *understand* mathematical concepts, instead of simply teaching procedures. It wasn’t until I started university that I began to fully comprehend the “why”s and “how”s of mathematical mechanics. In fact, I found myself guilty of using a procedure when investigating Graham Fletcher’s 3-Act Task. In the first video, I made an estimate of the number of Skittles in the jar. But then in the second video, I used the information provided about the number of Skittles in each bag, and the number of bags used, to adjust my estimate. How did I do this? I took the product of 14 (the number of Skittles in a bag) and 58 (the number of bags). Yes, I fell for this trick! It took a moment to realize that the number of bags was fixed, but the number of candies within each bag is likely to differ. It’s these conceptual habits that should be fostered within students, beginning at the youngest possible age. I believe that children are naturally curious about these activities as it is, and already have an inherent sense of wonderment. But somewhere along the way (before the new standards), this desire to learn was hampered by robot-like procedures. These children are the future, and I feel very inspired knowing that they seem to be on an optimal path! Thanks for sharing, Lisa. I had to call out one of your paragraphs with a “whoa” above. I hadn’t given enough thought to the difference between students whose entire education was in the Common Core era versus those who have had to adapt. Very provocative. Looking forward to checking in on these ideas more at CSUEB later this semester. The challenge I’ve had is anticipating how students will approach a task and misconceptions they’ll have (which are sometimes about life and not about math), and planning my responses to their struggle so that it stays productive. So far this year I’ve taught in 1st, 2nd, 4th, 5th and 6th grade classrooms, sometimes using the same task with different grade levels which has been very interesting to see how students see and approach things differently. It’s been a great learning experience. Right! Our most interesting struggle was around the different jar question. The math was more straightforward. That was interesting.